Latinxs In Swing States Are Racing to Register to Vote. Wonder Why? 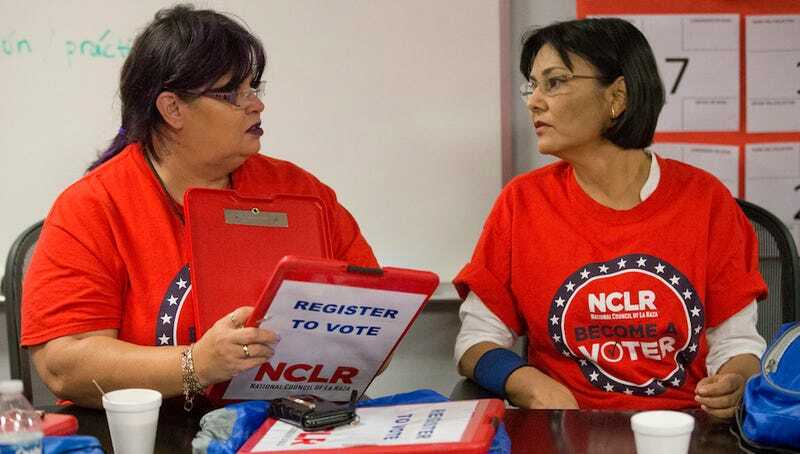 The Wall Street Journal reports that, for some reason, Latinxs in swing states like Florida, Nevada and Colorado are registering to vote “in record numbers.” Hmm. Gosh. Why could this be? In those three states, Latinx voters comprise between 15 and 20% of the total vote, and it’s largely accepted that whichever presidential candidate hopes to win must secure a majority of Latinxs, who are growing in population and as a voting bloc. With the help of voter drives arranged by organizations like the National Council of La Raza, Voto Latino and Mi Familia Vota—as well as another outlier factor which may or may not possess the shade and disposition of a months-old open bag of Takis Xplosion smashed inside a broken slot machine ashtray—the number of Latinxs registering to vote is expected to rise by the tens of thousands compared to 2012. The WSJ also identifies North Carolina as a key state, where Latinxs comprise only 2% of its registered voters but where even such a comparatively small number has the capability of swinging a vote. And in Georgia, a June Atlanta Journal-Constitution report cited a projection by the Georgia Association of Latino Elected Officials that the state could become more Democrat in coming years—and perhaps even by November—due to the surge in registered Latinx voters. Canvassers Ana Iris Melendez, left, and Ana Mejia chat as they prepare their voter-registration materials, Thursday, April 7, 2016, in Miami. Image via AP.